1763 - The Proclamation of 1763, signed by King George III of England, prohibits any English settlement west of the Appalachian mountains and requires those already settled in those regions to return east in an attempt to ease tensions with Native Americans. 1764 - The Sugar Act is passed by the English Parliament to offset the war debt brought on by the French and Indian War and to help pay for the expenses of running the colonies and newly acquired territories. This act increases the duties on imported sugar and other items such as textiles, coffee, wines and indigo (dye). It doubles the duties on foreign goods reshipped from England to the colonies and also forbids the import of foreign rum and French wines. 1764 - The English Parliament passes a measure to reorganize the American customs system to better enforce British trade laws, which have often been ignored in the past. A court is established in Halifax, Nova Scotia, that will have jurisdiction over all of the American colonies in trade matters. 1764 - The Currency Act prohibits the colonists from issuing any legal tender paper money. This act threatens to destabilize the entire colonial economy of both the industrial North and agricultural South, thus uniting the colonists against it. 1764 - In May, at a town meeting in Boston, James Otis raises the issue of taxation without representation and urges a united response to the recent acts imposed by England. In July, Otis publishes "The Rights of the British Colonies Asserted and Proved." In August, Boston merchants begin a boycott of British luxury goods. 1765 - In March, the Stamp Act is passed by the English Parliament imposing the first direct tax on the American colonies, to offset the high costs of the British military organization in America. Thus for the first time in the 150 year old history of the British colonies in America, the Americans will pay tax not to their own local legislatures in America, but directly to England. Under the Stamp Act, all printed materials are taxed, including; newspapers, pamphlets, bills, legal documents, licenses, almanacs, dice and playing cards. The American colonists quickly unite in opposition, led by the most influential segments of colonial society - lawyers, publishers, land owners, ship builders and merchants - who are most affected by the Act, which is scheduled to go into effect on November 1. 1765 - Also in March, the Quartering Act requires colonists to house British troops and supply them with food. 1765 - In May, in Virginia, Patrick Henry presents seven Virginia Resolutions to the House of Burgesses claiming that only the Virginia assembly can legally tax Virginia residents, saying, "If this be treason, make the most of it." Also in May, the first medical school in America is founded, in Philadelphia. 1765 - In July, the Sons of Liberty, an underground organization opposed to the Stamp Act, is formed in a number of colonial towns. Its members use violence and intimidation to eventually force all of the British stamp agents to resign and also stop many American merchants from ordering British trade goods. 1765 - August 26, a mob in Boston attacks the home of Thomas Hutchinson, Chief Justice of Massachusetts, as Hutchinson and his family narrowly escape. 1765 - In October, the Stamp Act Congress convenes in New York City, with representatives from nine of the colonies. The Congress prepares a resolution to be sent to King George III and the English Parliament. The petition requests the repeal of the Stamp Act and the Acts of 1764. The petition asserts that only colonial legislatures can tax colonial residents and that taxation without representation violates the colonists' basic civil rights. 1765 - On November 1, most daily business and legal transactions in the colonies cease as the Stamp Act goes into effect with nearly all of the colonists refusing to use the stamps. In New York City, violence breaks out as a mob burns the royal governor in effigy, harasses British troops, then loots houses. 1765 - In December, British General Thomas Gage, commander of all English military forces in America, asks the New York assembly to make colonists comply with the Quartering Act and house and supply his troops. Also in December, the American boycott of English imports spreads, as over 200 Boston merchants join the movement. 1766 - In January, the New York assembly refuses to completely comply with Gen. Gage's request to enforce the Quartering Act. 1766 - In March, King George III signs a bill repealing the Stamp Act after much debate in the English Parliament, which included an appearance by Ben Franklin arguing for repeal and warning of a possible revolution in the American colonies if the Stamp Act was enforced by the British military. 1766 - On the same day it repealed the Stamp Act, the English Parliament passes the Declaratory Act stating that the British government has total power to legislate any laws governing the American colonies in all cases whatsoever. 1766 - In April, news of the repeal of the Stamp Act results in celebrations in the colonies and a relaxation of the boycott of imported English trade goods. 1766 - In August, violence breaks out in New York between British soldiers and armed colonists, including Sons of Liberty members. The violence erupts as a result of the continuing refusal of New York colonists to comply with the Quartering Act. In December, the New York legislature is suspended by the English Crown after once again voting to refuse to comply with the Act. 1767 - In June, The English Parliament passes the Townshend Revenue Acts, imposing a new series of taxes on the colonists to offset the costs of administering and protecting the American colonies. Items taxed include imports such as paper, tea, glass, lead and paints. The Act also establishes a colonial board of customs commissioners in Boston. In October, Bostonians decide to reinstate a boycott of English luxury items. 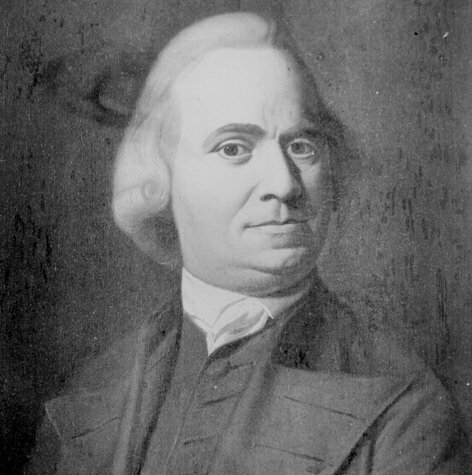 1768 - In February, Samuel Adams of Massachusetts writes a Circular Letter opposing taxation without representation and calling for the colonists to unite in their actions against the British government. The letter is sent to assemblies throughout the colonies and also instructs them on the methods the Massachusetts general court is using to oppose the Townshend Acts. 1768 - In April, England's Secretary of State for the Colonies, Lord Hillsborough, orders colonial governors to stop their own assemblies from endorsing Adams' circular letter. Hillsborough also orders the governor of Massachusetts to dissolve the general court if the Massachusetts assembly does not revoke the letter. By month's end, the assemblies of New Hampshire, Connecticut and New Jersey have endorsed the letter. 1768 - In May, a British warship armed with 50 cannons sails into Boston harbor after a call for help from custom commissioners who are constantly being harassed by Boston agitators. In June, a customs official is locked up in the cabin of the Liberty, a sloop owned by John Hancock. Imported wine is then unloaded illegally into Boston without payment of duties. Following this incident, customs officials seize Hancock's sloop. After threats of violence from Bostonians, the customs officials escape to an island off Boston, then request the intervention of British troops. 1768 - In July, the governor of Massachusetts dissolves the general court after the legislature defies his order to revoke Adams' circular letter. In August, in Boston and New York, merchants agree to boycott most British goods until the Townshend Acts are repealed. In September, at a town meeting in Boston, residents are urged to arm themselves. Later in September, English warships sail into Boston Harbor, then two regiments of English infantry land in Boston and set up permanent residence to keep order. 1769 - In March, merchants in Philadelphia join the boycott of British trade goods. In May, a set of resolutions written by George Mason is presented by George Washington to the Virginia House of Burgesses. The Virginia Resolves oppose taxation without representation, the British opposition to the circular letters, and British plans to possibly send American agitators to England for trial. Ten days later, the Royal governor of Virginia dissolves the House of Burgesses. However, its members meet the next day in a Williamsburg tavern and agree to a boycott of British trade goods, luxury items and slaves. 1769 - In July, in the territory of California, San Diego is founded by Franciscan Friar Juniper Serra. In October, the boycott of English goods spreads to New Jersey, Rhode Island, and then North Carolina. 1770 - The population of the American colonies reaches 2,210,000 persons. 1770 - Violence erupts in January between members of the Sons of Liberty in New York and 40 British soldiers over the posting of broadsheets by the British. Several men are seriously wounded. 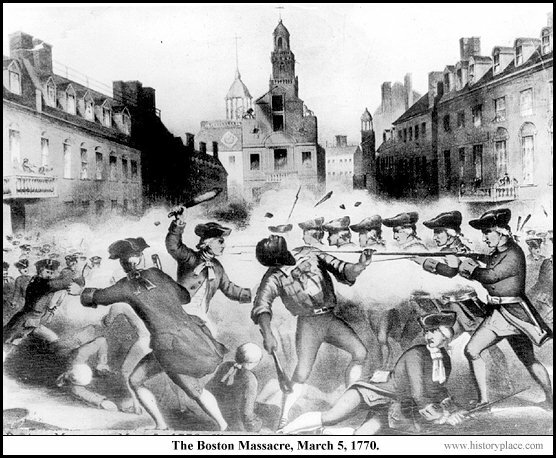 March 5, 1770 - The Boston Massacre occurs as a mob harasses British soldiers who then fire their muskets pointblank into the crowd, killing three instantly, mortally wounding two others and injuring six. After the incident, the new Royal Governor of Massachusetts, Thomas Hutchinson, at the insistence of Sam Adams, withdraws British troops out of Boston to nearby harbor islands. The captain of the British soldiers, Thomas Preston, is then arrested along with eight of his men and charged with murder. 1770 - In April, the Townshend Acts are repealed by the British. All duties on imports into the colonies are eliminated except for tea. Also, the Quartering Act is not renewed. 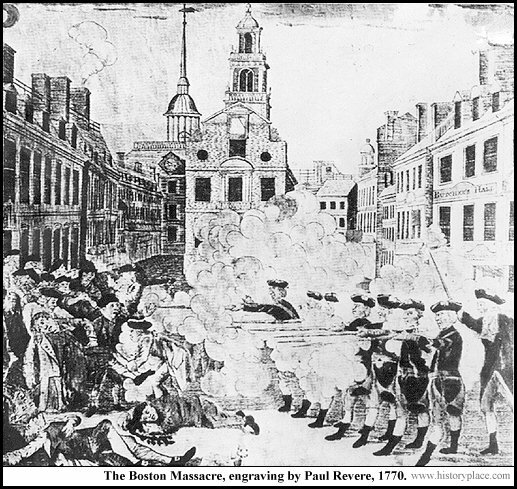 1770 - In October, trial begins for the British soldiers arrested after the Boston Massacre. Colonial lawyers John Adams and Josiah Quincy successfully defend Captain Preston and six of his men, who are acquitted. Two other soldiers are found guilty of manslaughter, branded, then released. 1772 - In June, a British customs schooner, the Gaspee, runs aground off Rhode Island in Narragansett Bay. Colonists from Providence row out to the schooner and attack it, set the British crew ashore, then burn the ship. In September, a 500 pound reward is offered by the English Crown for the capture of those colonists, who would then be sent to England for trial. The announcement that they would be sent to England further upsets many American colonists. 1772 - In November, a Boston town meeting assembles, called by Sam Adams. During the meeting, a 21 member committee of correspondence is appointed to communicate with other towns and colonies. A few weeks later, the town meeting endorses three radical proclamations asserting the rights of the colonies to self-rule. 1773 - In March, the Virginia House of Burgesses appoints an eleven member committee of correspondence to communicate with the other colonies regarding common complaints against the British. Members of that committee include, Thomas Jefferson, Patrick Henry and Richard Henry Lee. Virginia is followed a few months later by New Hampshire, Rhode Island, Connecticut and South Carolina. 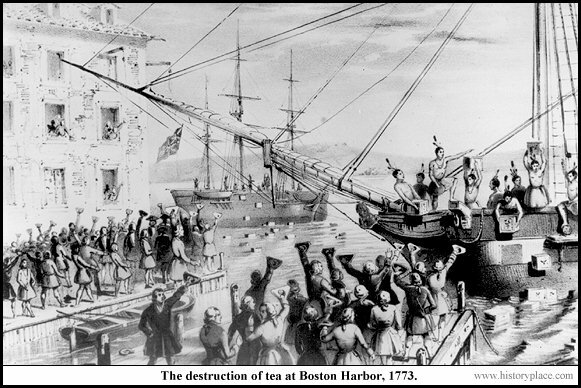 1773 - May 10, the Tea Act takes effect. It maintains a threepenny per pound import tax on tea arriving in the colonies, which had already been in effect for six years. It also gives the near bankrupt British East India Company a virtual tea monopoly by allowing it to sell directly to colonial agents, bypassing any middlemen, thus underselling American merchants. The East India Company had successfully lobbied Parliament for such a measure. In September, Parliament authorizes the company to ship half a million pounds of tea to a group of chosen tea agents. 1773 - In October, colonists hold a mass meeting in Philadelphia in opposition to the tea tax and the monopoly of the East India Company. A committee then forces British tea agents to resign their positions. In November, a town meeting is held in Boston endorsing the actions taken by Philadelphia colonists. Bostonians then try, but fail, to get their British tea agents to resign. A few weeks later, three ships bearing tea sail into Boston harbor. 1773 - November 29/30, two mass meetings occur in Boston over what to do about the tea aboard the three ships now docked in Boston harbor. Colonists decide to send the tea on the ship, Dartmouth, back to England without paying any import duties. The Royal Governor of Massachusetts, Hutchinson, is opposed to this and orders harbor officials not to let the ship sail out of the harbor unless the tea taxes have been paid. 1774 - In March, an angry English Parliament passes the first of a series of Coercive Acts (called Intolerable Acts by Americans) in response to the rebellion in Massachusetts. The Boston Port Bill effectively shuts down all commercial shipping in Boston harbor until Massachusetts pays the taxes owed on the tea dumped in the harbor and also reimburses the East India Company for the loss of the tea. 1774 - May 12, Bostonians at a town meeting call for a boycott of British imports in response to the Boston Port Bill. May 13, General Thomas Gage, commander of all British military forces in the colonies, arrives in Boston and replaces Hutchinson as Royal governor, putting Massachusetts under military rule. He is followed by the arrival of four regiments of British troops. 1774 - May 17-23, colonists in Providence, New York and Philadelphia begin calling for an intercolonial congress to overcome the Coercive Acts and discuss a common course of action against the British. 1774 - May 20, The English Parliament enacts the next series of Coercive Acts, which include the Massachusetts Regulating Act and the Government Act virtually ending any self-rule by the colonists there. Instead, the English Crown and the Royal governor assume political power formerly exercised by colonists. Also enacted; the Administration of Justice Act which protects royal officials in Massachusetts from being sued in colonial courts, and the Quebec Act establishing a centralized government in Canada controlled by the Crown and English Parliament. The Quebec Act greatly upsets American colonists by extending the southern boundary of Canada into territories claimed by Massachusetts, Connecticut and Virginia. 1774 - In June, a new version of the 1765 Quartering Act is enacted by the English Parliament requiring all of the American colonies to provide housing for British troops in occupied houses and taverns and in unoccupied buildings. In September, Massachusetts Governor Gage seizes that colony's arsenal of weapons at Charlestown. 1774 - September 5 to October 26, the First Continental Congress meets in Philadelphia with 56 delegates, representing every colony, except Georgia. Attendants include Patrick Henry, George Washington, Sam Adams and John Hancock. On September 17, the Congress declares its opposition to the Coercive Acts, saying they are "not to be obeyed," and also promotes the formation of local militia units. On October 14, a Declaration and Resolves is adopted that opposes the Coercive Acts, the Quebec Act, and other measure taken by the British that undermine self-rule. The rights of the colonists are asserted, including the rights to "life, liberty and property." On October 20, the Congress adopts the Continental Association in which delegates agree to a boycott of English imports, effect an embargo of exports to Britain, and discontinue the slave trade. 1775 - February 1, in Cambridge, Mass., a provincial congress is held during which John Hancock and Joseph Warren begin defensive preparations for a state of war. February 9, the English Parliament declares Massachusetts to be in a state of rebellion. March 23, in Virginia, Patrick Henry delivers a speech against British rule, stating, "Give me liberty or give me death!" March 30, the New England Restraining Act is endorsed by King George III, requiring New England colonies to trade exclusively with England and also bans fishing in the North Atlantic. 1775 - In April, Massachusetts Governor Gage is ordered to enforce the Coercive Acts and suppress "open rebellion" among the colonists by all necessary force.